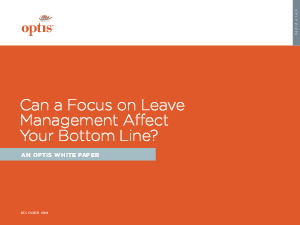 > Optis > White Paper: Can a Focus on Leave Management Affect Your Bottom Line? The uncertain economic environment has shifted the focus of human resources and employee benefits in many companies away from retention to concentrating on improving productivity, driving down costs and improving other returns. But the alarming reality is that the cost of all employee absence accounts for an astronomical 36 percent of an employer’s payroll. In the white paper “Can a Focus on Leave Management Affect Your Bottom Line?” Optis reviews all the factors that impact leave, as well as how companies can better manage absence. The biggest danger companies face is that siloed systems cost more than they realize. The answer lies in integrating absence information. Companies can then improve programs to help return healthy and productive employees to work sooner, reduce administrative burdens and lower costs.